So by now you’re all no doubt familiar with iPhone social photography app Instagram (which Alex recently “>reviewed) and if you’ve spent any time working with it you likely noticed a somewhat important omission: a web component. There is no official web interface for Instagram profiles; a user must explicitly “share” a photo and even then only that single image is viewable. There are no galleries or user profiles which makes it difficult to share your profile outside the spiked, aluminum-lined garden of iPhone land. 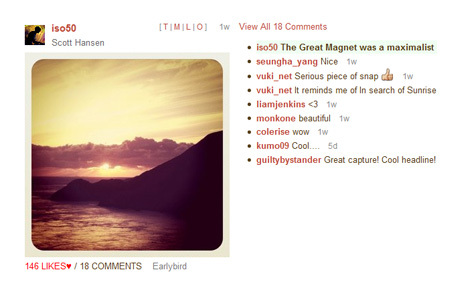 But now Japanese developer Joe Mio has create this missing web interface in Webstagram. The Webstagram site allows access to most of Instagram’s viewing features without the need for an iPhone or even Instagram itself. I’m wondering what Instagram think of all this. Webstagram apparently works by accessing the Instagram API, which would lead me to believe this behavior is sanctioned, at least tacitly. I wasn’t about to enter my Instagram user/pass to try out the logged in state of Webstagram, so I’ll leave it to someone a little more brave to figure out whether you can favorite things (apparently you can comment directly from Webstagram). While useful and convenient, aesthetically, Webstagram disappoints. The Instagram experience is very branded and consistent. On the contrary, Webstagram sports a bare-bones interface that detracts from the overall cohesiveness and flow of browsing a feed. Here’s to hoping the Instagram guys whip up their own proper web interface with a little richer feature set and a cleaner design. You can access my ISO50 Instagram feed at Webstagram or via @iso50 in the App. Edit: There is an alternative web interface here, although I am not sure that you can reference a user’s feed directly via a url. Thanks Bramus for the link. Instagram Impressions Apple iPhone 5 “P.. iPhone 5 Camera x Icela.. I need Instagram rehab. It’s more addictive than alcohol or drugzzz! They already blocked the feature on Webstagram that you can replay all your likes. “Dark evil forces” used that for spam. Must say I like the interface of http://instagram.joshink.com/ more. RSS feeds however aren’t provided (but I’m quite sure that can be requested). Thanks for sharing Scott! I wondered when these would start popping up. I’m @spore for random things down in NZ. digging gramfeed the best, so far! I like both Instagram and Hipstamatic. Hipstamatic has several options to purchase but still and all only cost about 7 bucks and I’ve gotten some awesome with that. I love how there are different lens choices as well as film. Navigate with the arrow keys. I think instagram has great potential to become the primary social mobile photography network. Flickr has had the ability to upload from mobile devices for a while but the social aspect of randomly sharing/viewing isn’t as strong. But I kind of like the idea of not having profiles/friends/galleries because it forces you to be exposed to something new constantly (similar to the ffffound dynamic). pretty easy to use and nice filters! webstagram is connected with instagram If you are a user of instagram and you follow webstagram you can see that all the photos that webstagram “likes” end up or are on the popular page. i have used the web version which is nice for viewing a lot of a persons feed all at once using the grid option. It is still slow to work with you can comment etc. for the most part large viewing and liking picks is easy while you are on the computer using webstagram. It must be interconnected to the system its self! It’s a nice tool but I prefer inkstagram for online viewing and posting!